1026, Hubcap used, 15", 69-70, BUICK, ELECTRA, WIRE TYPE. 1036, Hubcap, 15", 71-72, BUICK, PASSENGER, WIRE TYPE, 3-1/2" HUB. 1046, Hubcap used, 14", 73-78, BUICK, APOLLO, CENTURY, REGAL, SKYLARK, WIRE TYPE. 1069a, Hubcap used, 15", 77-78, BUICK, RIVIERA, WIRE TYPE, RED CENTER. 1069b, Hubcap used, 15", 77-78, BUICK, RIVIERA, WIRE TYPE, BLACK CENTER. 1099, Hubcap used, 15", 80-85, BUICK, RIVIERA, POLISHED OUTER RING, WIRE TYPE. METAL CLIPS, CENTERS SOLD SEPARATE. 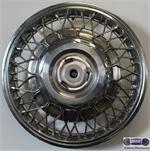 1099, Hubcap used, 15", 80-85, BUICK, RIVIERA, POLISHED OUTER RING, WIRE TYPE. METAL CLIPS, CENTERS SOLD SEPARATE. (NOTE, 2 DISC DEPTH, SIZES USED 4-1/4" & 4-3/4") CENTER SOLD SEPERATE. 1111c, HUBCAP USED, 14", 89-91, BUICK, ELECTRA, LESABRE, PARK AVE, WIRE TYPE, BLACK RUBBER GASKET ON OUTER EDGE, INNER BLACK PLASTIC CENTER WITH 3 RETAINING CLIPS, 2 ROW OF 32 WIRES, PLASTIC LOCK NUT NOT INCLUDED.& CENTER SOLD SEPARATE. 1111e, HUBCAP CENTER USED, 86-88, BUICK, RIVIERA, CHROME OUTER RING W/ 3 NOTCHES, BLACK CENTER, CHROME LOGO, 3 PLASTIC CLIPS, 3-1/4" DIA. 1111e, HUBCAP CENTER USED, 14", 86-88, BUICK, RIVIERA, CHROME OUTER RING WITH 3 NOTCHES, BLACK CENTER, CHROME LOGO, 3 PLASTIC CLIPS, 3-1/4" DIA. 1127, Hubcap used, 14", 88-91, BUICK, REGAL, POLISHED OUTER RING & MACHINED INNER, WIRE TYPE. CENTER SOLD SEPARATE. 137, HUBCAP USED, 14", 79-80, AMC, CONCORD, PACER, SPIRIT, WIRE TYPE. 141, HUBCAP USED, 14", 81-83, AMC, CONCORD, SPIRIT, WIRE TYPE. 146, Hubcap used, 15", 85-88, AMC, EAGLE, WIRE TYPE.